For one week only you can get 50% off Craftsy’s Freeform Crochet Class. This takes the class down to only $19.99. Offer ends on December 7th, 2014 at 11:59pm MST. I was lucky enough to take part in this class. I learned so much! Myra Wood is the instructor for this class. Throughout the seven lessons she will share with you many techniques needed to get started with Freeform Crochet. You will also learn how to make a one-of-a-kind scrumbled bag. Lesson 1: This lesson is a great start to the class. You will be introduced to Myra Wood and be introduced to the world of Freeform Crochet. Myra makes you feel comfortable improvising your crochet, talks you through creating a flat fabric and shows you how to begin your crochet using the magic circle. Lesson 2: In this lesson you will learn how to build out your fabric and create spirals. Lesson 3: This lesson is all about texture. Myra teaches you how to do four textured stitches. The fan, popcorn, berry and box stitch. You will also learn how to overlay stitches on top of your fabric to add more interest to your motifs. Lesson 4: Myra will now teach you more special stitches to use in your freeform crochet. The bullion stitch and the crab stitch. Lesson 5: Now you will learn how to make some scrumbles. These are the basis of freeform fabric. You will learn how to join your shapes, fill in ditches and how to work around the outside edge. Lesson 6: Learn how to join the fabric to fit a template and then learn how to add edges and fill in holes to square up the sides. Lesson 7: This lesson is all about finishing. Learn how to turn your fabric into a handbag. Myra teaches you how to seam, create a lining and add a button closure and strap. Myra also shows you a variety of other projects you can create with all the techniques you have just learned. While I was practicing all the stitches and attempting my first piece of freeform crochet, my daughter came up to me. She decided that whatever I was making should be for her (she’s three). So I had to come up with something to quickly turn it into. I went with a hat. It’s just about summer here so she will have to wait to wear it but she is pretty happy with how it turned out. 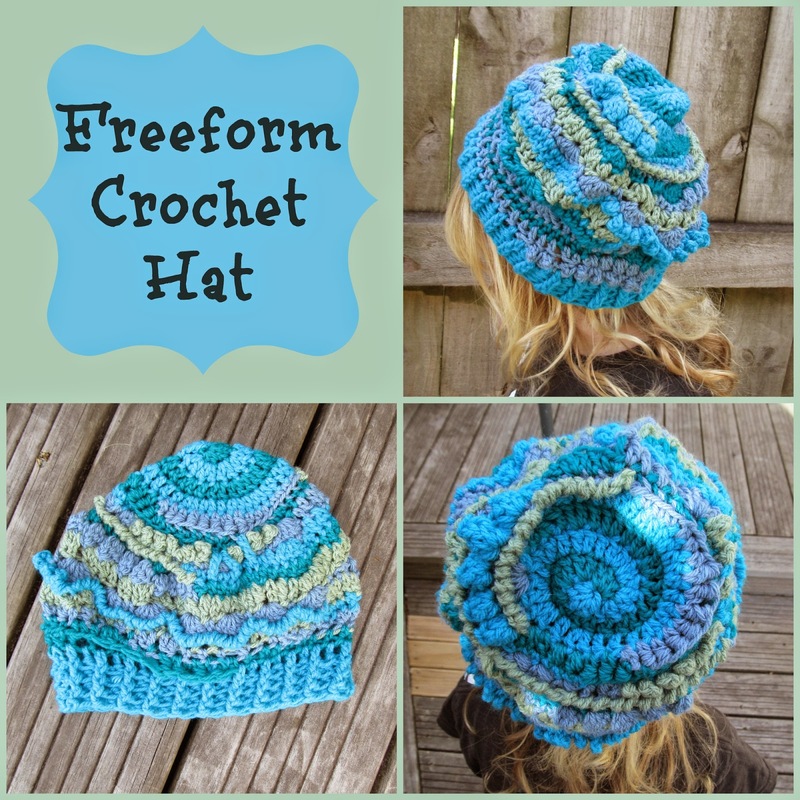 Freeform crochet gives you the perfect opportunity to be creative. I loved just letting go and placing stitches where ever I wanted to. I urge you to try it. If you are not sure on what you would make with it, simple type ‘Freeform Crochet’ into a search box and let the inspiration in. Anything is possible. Get 50% off Craftsy’s Freeform Crochet Class until the 7th of December, 2014 at 11:59pm MST. Also until 11.59pm MST on the 1st of December, 2014 you can get all Craftsy Classes for only $19.99. They have a lot to offer and I am sure you will find something you absolutely love.